Abstract: This open-label, single-arm, multicenter, 13-week, prospective study explored the efficacy, safety, and tolerability of paliperidone palmitate (150 milligram equivalents [mg eq] [day 1], 100 mg eq [day 8], both deltoid injections; 75–150 mg eq, deltoid/gluteal injection) in Chinese patients with acute schizophrenia (Positive and Negative Syndrome Scale [PANSS] total score ≥70), who previously had unsatisfactory therapeutic effect following oral antipsychotic treatment (without washout period). Primary efficacy endpoint was percentage of patients with ≥30% improvement in the PANSS total score at the end of 13 weeks. Secondary efficacy endpoints included change from baseline to end of week 13 in PANSS total score, PANSS subscale scores, Marder factor scores, Clinical Global Impressions–Severity score, and Personal and Social Performance Scale scores. Overall, 477/610 enrolled patients (full analysis set, 78.2%) completed the study (men: 55.1%; women: 44.9%; mean age: 31.5 years). Total, 443/610 (72.6%, full analysis set) patients achieved primary endpoint (mean [standard deviation] change from baseline: –30.9 [19.51]). All secondary endpoints demonstrated significant improvement at the end of 13 weeks. One death occurred during this acute phase. The most common (>5%) treatment-emergent adverse events were extrapyramidal disorders (8.4%). The efficacy and safety data are consistent with other short-term, placebo-controlled studies of paliperidone palmitate conducted in similar populations. Paliperidone palmitate (PP), an LAI antipsychotic, is approved for acute and maintenance treatment of schizophrenia in adults in the United States, Europe, People’s Republic of China, Korea, and several other countries.5,6 An earlier study with PP demonstrated that once-monthly treatment with PP is rapid-acting in the acute phase and effectively prevents relapse during long-term maintenance.6 Most of these studies were performed using fixed dosages of PP to treat well-defined groups of patients with schizophrenia and typically included an initial washout period.7–10 A few of these studies were performed using flexible dosing of PP, which better reflects how dosing is implemented in real-life clinical settings with more diverse patient populations (eg, having higher comorbidities, using more comedications, or containing a mix of disease severities).6,11–13 However, there remains lack of data on PP’s use as a flexible-dose treatment in patients with schizophrenia who are directly switched from oral antipsychotic drugs without any washout period, as may occur in a clinical setting. Because comparative information regarding the efficacy and safety between PP and other treatment drugs is available from a series of randomized, double-blind, placebo-controlled, Phase III clinical studies on PP in both global population8,9,14,15 as well as Chinese population14 with schizophrenia, the objective of the current exploratory study was to determine the efficacy of flexibly dosed PP in Chinese patients with acute schizophrenia who were previously unsatisfactorily treated with oral antipsychotics. The acute phase of the flexible-dose, open-label, single-arm, multicenter, prospective study was conducted from October 2012 to November 2013 at 22 sites in the People’s Republic of China. 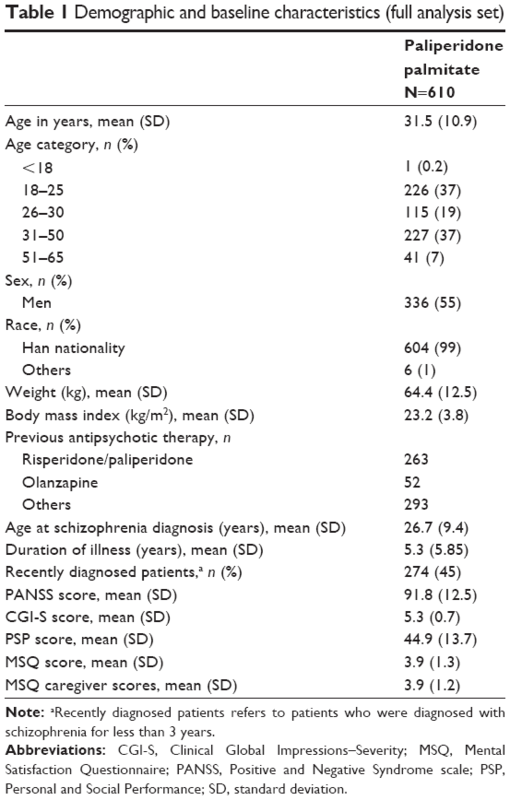 Men and women (both inpatients as well as outpatients), aged 18–65 years (both inclusive), with a diagnosis of acute schizophrenia based on the Diagnostic and Statistical Manual of Mental Disorders-IV-Text Revision (DSM-IV-TR; Positive and Negative Syndrome Scale [PANSS] score ≥70), who had a PANSS total score between 70 and 120 at screening and baseline were enrolled. Enrolled patients could have either had prior antipsychotic treatment or not, but all lacked a satisfactory therapeutic effect (defined as patients with PANSS score above 70 in spite of previous treatment, and who were willing to switch to another antipsychotic). Exclusion criteria of the study were active DSM-IV-TR axis I diagnosis other than schizophrenia (dissociative disorder, bipolar disorder, major depressive disorder, schizoaffective disorder, schizophreniform disorder, autistic disorder, primary substance-induced psychotic disorder); a DSM-IV-TR diagnosis of active substance dependence (excluding nicotine and caffeine dependence) within 6 months before screening; history of suicide or imminent risk of suicide or violent behavior; first episode patients of schizophrenia; encephalopathic syndrome; mild-moderate or severe mental retardation; risk factors for prolonged QT interval; presence of circumstances that may increase the risk of the occurrence of torsade de pointes or sudden death; pregnancy; and lactating women. Patients treated with clozapine for treatment refractory or treatment resistant schizophrenia, monoamine oxidase inhibitor antidepressants within 30 days before screening, and depot antipsychotic drugs including PP within six injection interval or electroconvulsive therapy within 30 days before screening were all excluded from the study. Stable doses of antidepressants started 30 days before the study were continued throughout. Oral lorazepam or other short-acting benzodiazepines were permissible for agitation or anxiety. Previously used oral antipsychotic drugs were to be gradually reduced and stopped within 2 weeks after the first PP injection. The independent ethics committee or institutional review board at each study site approved the protocol, and the study was conducted in accordance with the ethical principles that have their origin in the Declaration of Helsinki and that are consistent with Good Clinical Practices and applicable regulatory requirements. All patients provided written informed consent before enrollment. Because doses of PP can be expressed both in terms of milligram equivalents (mg eq) of the pharmacologically active fraction, ie, paliperidone, and in milligrams of PP, the doses expressed as PP 75, 100, and 150 mg eq equate to 117, 156, and 234 mg, respectively, of PP. The study medication PP was provided as 75, 100, and 150 mg eq injectable suspensions (supplied as 156 mg/mL). The study consisted of three phases: screening (1 week), acute treatment phase (13 weeks), and follow-up phase (1 year). Patients without documented previous exposure to oral risperidone, paliperidone extended release, or risperidone depot suspension were administered risperidone (at least 1 mg/day, ≥3 days) or paliperidone extended release (at least 3 mg/day, ≥3 days). Patients were enrolled only if they demonstrated tolerability to these medications. During the acute treatment phase, patients received intramuscular injection of 150 mg eq dose of PP on day 1 and 100 mg eq PP dose on day 8 (both deltoid), followed by a monthly maintenance dose between 75 and 150 mg eq on days 36, 64, and 92 (deltoid or gluteal). Baseline values were taken on the day when the first dose of PP (150 mg eq) was given. Follow-up was conducted at the end of weeks 26, 39, 52, and 65. Data from the follow-up phase are reported separately. The primary efficacy endpoint was the percentage of patients with ≥30% improvement in the PANSS total score from baseline to end of 13 weeks. The PANSS scale is a 30-item scale with each item rated on a scale of 1 (absent) to 7 (extreme). It provides a total score (range 30–210) and scores for the following three subscales: positive subscale (range 7–49): sum of items P1 to P7 in the positive subscale; negative subscale (range 7–49): sum of items N1 to N7 in the negative subscale; general psychopathology (range 16–112): sum of items G1 to G16 in the general psychopathology subscale. Secondary endpoints included change from baseline to end of week 13 in PANSS total score, PANSS subscale scores, and Marder factor scores (positive symptoms [range 8–56]: sum of delusions, hallucinatory behavior, grandiosity, suspiciousness [items P1, P3, P5, and P6 in the positive subscale], stereotyped thinking [item N7 in the negative subscale], somatic concern, unusual thought content, lack of judgment/insight [items G1, G9, and G12 in the general psychopathology subscale]; negative symptoms [range 7–49]: sum of blunted affect, emotional withdrawal, poor rapport, passive social withdrawal, lack of spontaneity [items N1, N2, N3, N4, and N6 in the negative subscale], motor retardation, and active social avoidance [items G7 and G16 in the general psychopathology subscale]; disorganized thoughts [range 7–49]: sum of conceptual disorganization [item P2 in the positive subscale], difficulty in abstract thinking [item N5 in the negative subscale], mannerisms and posturing, disorientation, poor attention, disturbance of volition, and preoccupation [items G5, G10, G11, G13, and G15 in the general psychopathology subscale]; uncontrolled hostility/excitement [range 4–28]: sum of excitement, hostility [items P4 and P7 in the positive subscale], uncooperativeness, and poor impulse control [items G8 and G14 in the general psychopathology subscale]; anxiety/depression [range 4–28]: anxiety, guilt feelings, tension, and depression [items G2, G3, G4, and G6 in the general psychopathology subscale]), Clinical Global Impressions–Severity (CGI-S) score (7-point scale ranging from 1 [not ill] to 7 [extremely severe]), Personal and Social Performance scale (PSP) score (a score between 71 and 100 indicated a mild degree of difficulty, a score between 31 and 70 indicated a moderate degree of dysfunction, and a score of 30 or less indicated functioning so poor that the patient required intensive supervision), medication satisfaction questionnaire, involvement evaluation questionnaire, medication adherence rating scale score, and medication preference questionnaire (MPQ) scores. Safety assessments included treatment-emergent adverse events (TEAEs), clinical laboratory tests, 12-lead electrocardiograms, vital signs measurement, and physical examination findings. The efficacy analysis was conducted in the full analysis set, which included all patients who received at least one dose of PP and had at least one postbaseline efficacy evaluation. The safety analysis set included all patients who received at least one dose of PP. Based on findings of an earlier study,16 the expected percentage of patients with at least 30% improvement in total PANSS was 40%. The percent change of PANSS total score was defined as (100× change)/(baseline −30), as 30 is the lowest value of PANSS. Using the large sample normal approximation, it was estimated that at least 93 patients were required to reach a 95% confidence interval (CI) for a single proportion that maximally extended 10% from the observed proportion. Considering the analysis of two subgroups (prior antipsychotics; recently diagnosed or not recently diagnosed based on the disease diagnosis time of 3 years), approximately 600 patients were planned to be included in the study. Paired t-test or Wilcoxon signed-rank test were used to analyze the changes before and after the treatment for all efficacy parameters. Safety was summarized using descriptive statistics. Overall, 616 (99.4%) out of 620 enrolled patients were included in the safety analysis set and 610 (98.4%) patients were included in the full analysis set. There was a slightly higher number of men than women (336 [55.1%] men and 274 [44.9%] women); mean standard deviation (SD) age was 31.5 (10.9) years. The majority (70.2%) of the patients were diagnosed with paranoid schizophrenia. The mean (SD) baseline PSP score was 44.9 (13.6), and the PANSS total score was 91.8 (12.5) (Table 1). Overall, 263 patients (60.5% men; mean age: 31.3 years) had prior risperidone or paliperidone treatment, while 52 patients (73.1% men; mean age: 29.9 years) were treated previously with olanzapine and 293 (47.4% men; mean age: 32.0 years) with other antipsychotic treatments. Of the total, 477 (78.2%) patients completed the acute treatment phase (Figure 1). 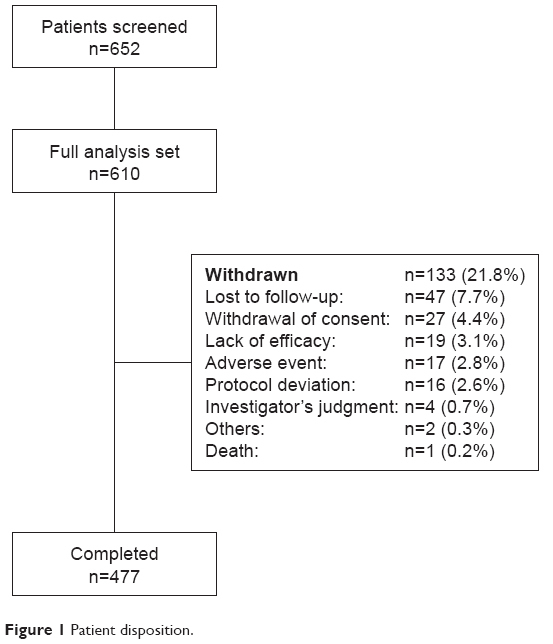 The most common reasons (>4% patients) for discontinuation were lost to follow-up (n=47, 7.7%) and withdrawal of consent (n=27, 4.4%) (Figure 1). Note: aRecently diagnosed patients refers to patients who were diagnosed with schizophrenia for less than 3 years. Abbreviations: CGI-S, Clinical Global Impressions–Severity; MSQ, Mental Satisfaction Questionnaire; PANSS, Positive and Negative Syndrome scale; PSP, Personal and Social Performance; SD, standard deviation. The most commonly received concomitant medications (more than five patients) included risperidone (n=215, 35.2%), trihexyphenidyl hydrochloride (n=135, 22.1%), herbal preparation (n=81, 13.3%), lorazepam (n=71, 11.6%), clonazepam (n=59, 9.7%), oral paliperidone (n=58, 9.5%), olanzapine (n=54, 8.9%), and quetiapine fumarate (n=41, 6.7%). Among all patients, mean (SD) per dose of PP received by each patient was 114.7 (23.41) mg eq (excluding the first and second injection dose, third injection dose: 114.6 [24.93] mg eq; fourth injection dose: 114.8 [26.22] mg eq; fifth injection dose: 114.7 [26.32] mg eq; final dose: 114.8 [26.26] mg eq). Mode dose received was 114.7 (25.91) mg eq. Median duration of the study drug exposure was 94 days (range: 1–153 days). 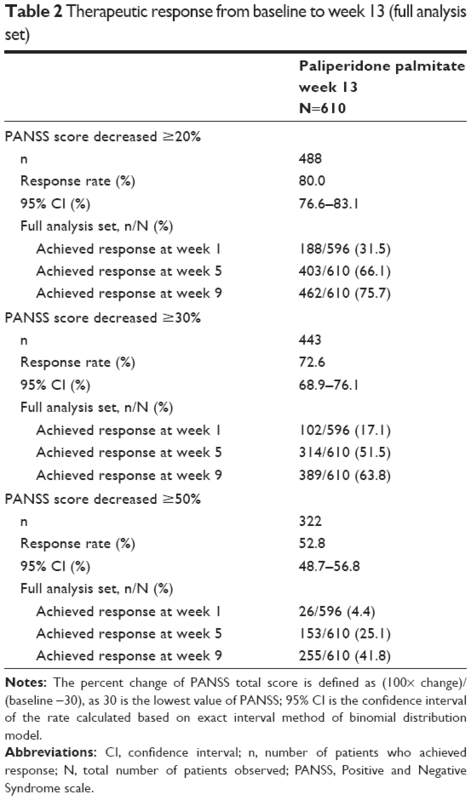 A total 443 patients (72.6%) out of 610 patients (full analysis set) achieved ≥30% decrease in PANSS total score from baseline to end of 13 weeks following PP treatment (last observation carried forward, 95% CI: 68.90–76.13) (Table 2). Of the 444 patients in the per protocol analysis set, 364 patients (84.5%) achieved ≥30% decrease in PANSS total score, 391 patients (90.7%) achieved ≥20% decrease in PANSS total score, and 274 patients (63.6%) achieved ≥50% decrease in PANSS total score at the end of 13 weeks. Notes: The percent change of PANSS total score is defined as (100× change)/(baseline −30), as 30 is the lowest value of PANSS; 95% CI is the confidence interval of the rate calculated based on exact interval method of binomial distribution model. Abbreviations: CI, confidence interval; n, number of patients who achieved response; N, total number of patients observed; PANSS, Positive and Negative Syndrome scale. The PANSS total score significantly improved (P<0.001) over time with a mean (SD) change from baseline of −9.7 (10.60) at the end of week 1 to −30.9 (19.51) at the end of week 13. All the PANSS Marder factor scores significantly improved (P<0.001) from baseline to end of 13 weeks following PP treatment, with the greatest improvement occurring in positive symptoms (mean [SD] change from baseline: −10.7 [7.1]) (Table 3). The mean (SD) change from baseline to end of 13 weeks in the CGI-S scores was −1.8 (1.3) and PSP score was 19.3 (16.3) (P<0.001 for both). Notes: Wilcoxon signed-rank test on change from baseline for continuous data in PANSS total, subscale and Marder, CGI-S, PSP total, MSQ score, IEQ subscale and total scores, and Bowker test on change from baseline for category data in PSP; *P<0.001. Abbreviations: CGI-S, Clinical Global Impression–Severity; IEQ, involvement evaluation questionnaire; MSQ, Medication Satisfaction Questionnaire; PANSS, Positive and Negative Syndrome scale; PSP, Personal and Social Performance; SD, standard deviation. The involvement evaluation questionnaire subscale and total scores, the MPQ scores, and medication adherence rating scale scores showed significant improvement from baseline to end of 13 weeks (P<0.001) following PP treatment (Table 3). Overall, 78% of patients preferred injections over tablets at the end of 13 weeks versus 60% patients who preferred injections at baseline. More than 50% of patients responded that injections were not complicated, and 48.4% of patients claimed that they did not have to worry about remembering to take their medication. Overall, 32% of patients noted they experienced fewer adverse effects when using injections (versus oral medications) and also considered the injections as more effective for their symptoms (eg, auditory hallucination). In terms of injection site, 70% of patients preferred the deltoid site for injection with almost 50% of the patients noting that deltoid injections were simpler; 45.6% of patients (n=278) felt less embarrassed to receive deltoid injections, indicating a slight majority felt comfortable with gluteal injections (Table 4). Notes: Chi-square test on change from baseline for category data of compliance, table/injection, and injection site; #P-value =0.178; *P<0.001. Abbreviations: MARS, Medication Adherence Rating Scale; MPQ, Medication Preference Questionnaire. Overall, 198 (32.1%) out of 616 patients (safety analysis set) experienced at least one TEAE. The most common (>2% incidence) TEAEs included extrapyramidal symptoms (EPS) (8.4%), insomnia (4.7%), constipation (4.4%), upper respiratory tract infection (4.1%), and akathisia (2.3%) (Table 5). There was one death and 14 patients had serious TEAEs during the study. These serious TEAEs included worsening of schizophrenia (n=8), EPS (n=3), and auditory hallucination, depression, lung infection, and hematuria (n=1 each). One patient was pregnant when exposed to PP. Seventeen patients (2.8%) experienced TEAEs that resulted in termination of treatment. The TEAEs that lead to permanent discontinuation of treatment included worsening of schizophrenia (n=6), EPS (n=3), followed by insomnia, auditory hallucination, bradycardia, depression, sinus bradycardia, akathisia, increased alanine transaminase and aspartate transaminase levels, lung infection, hematuria, and acne (n=1, each). 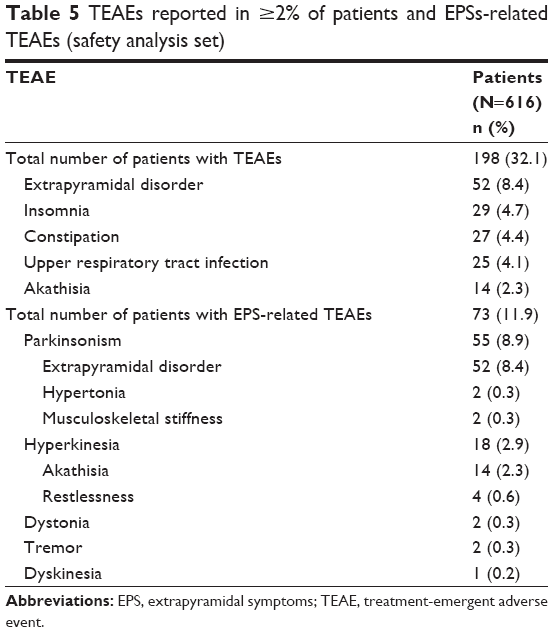 The most common categories of EPS-related TEAEs reported included parkinsonism (n=55, 8.9%) followed by hyperkinesia (n=18, 2.9%), dystonia (n=2; 0.3%), tremor (n=2; 0.3%), and dyskinesia (n=1, 0.2%) (Table 5). Abbreviations: EPS, extrapyramidal symptoms; TEAE, treatment-emergent adverse event. Nine patients experienced prolactin-related TEAEs in the acute treatment phase. Of these, 5 patients had increased prolactin levels, 2 women had delayed menses and 1 patient each had oligomenorrhea, irregular menstruation, and menstrual disorder. The TEAEs related to suicidality were reported in one patient. Overall, 170 patients (27.6%) had abnormalities in ECG readings values at baseline; at the end of 13 weeks, 83 patients (13.5%) had abnormalities in ECG readings. Increased body weight was reported as a TEAE in 7 patients. The mean (SD) body weight of patients treated with PP increased from 64.42 (12.44) kg (baseline) to 65.5 (12.20) kg at the end of 13 weeks. 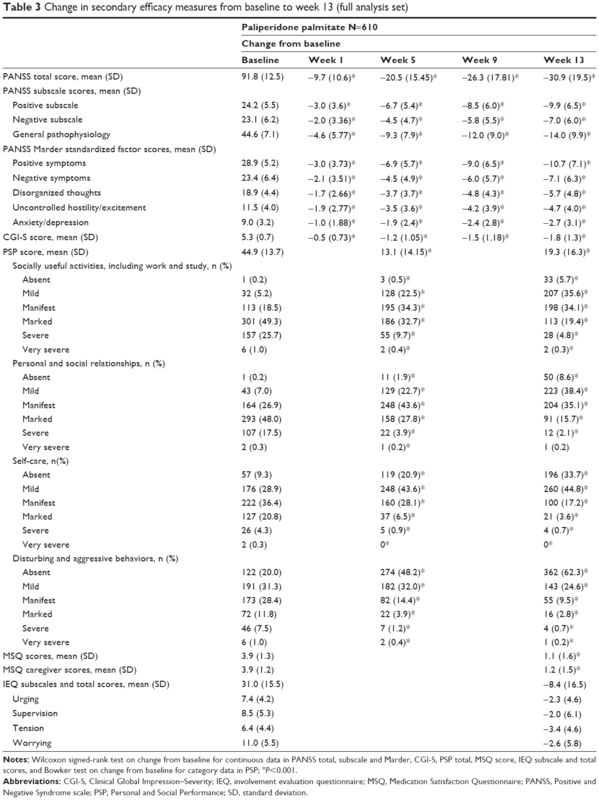 A total of 48 patients (7.8 %) had significant weight gain (increased ≥7% from baseline) while 16 patients (2.6%) had significant weight loss (decreased ≥7% from baseline) at the end of 13 weeks. This open-label, exploratory study is the first to examine the efficacy and safety of flexibly dosed PP in Chinese patients with acute schizophrenia who were previously unsatisfactorily treated and switched directly from oral antipsychotics. The study demonstrated that at the end of 13 weeks, PP (75, 100, and 150 mg eq) treatment significantly improved schizophrenia symptoms in these patients. Because most LAIs cannot rapidly achieve the efficacy needed for improving acute symptoms (and may require oral supplementation at initiation of dosing), LAI treatment is generally introduced at the maintenance phase of schizophrenia treatment. An earlier study in a Chinese population had demonstrated PP treatment to be efficacious in treating patients with acute symptoms.17 However, unlike the earlier study14 that had a definite washout period before switching treatments, the current study enrolled patients who were directly switched from the oral antipsychotic drugs without any washout period in the acute treatment phase. The open-label design of this study, wherein patients were aware that they are being treated with active products, may have resulted in some bias with regards to efficacy or adverse events reporting. This study was an exploratory trial, in which the objective was not to compare the efficacy and safety difference between PP and other treatments (such as active control, placebo). Because comparative information is available from a series of randomized, double-blind, placebo- or active-drug controlled Phase III clinical studies of PP,22,23 the current study mainly aimed to explore the efficacy of flexibly dosed PP in a Chinese patient population. The findings of the current study are of particular clinical relevance as the study design is more consistent with the type of treatment administered in clinical practice, where flexible dosing is usually applied. These findings may aid physicians in treating patients with schizophrenia after directly switching them from different previous oral antipsychotics. Further studies on symptomatic remission are warranted, however, to better understand the improvements in functional recovery in these patients. The efficacy data are consistent with other short-term, placebo-controlled studies of PP, conducted in similar populations. Safety and tolerability of all PP doses tested were consistent with the global safety profile and known pharmacology of paliperidone. No new safety signals and no noteworthy tolerability issues related to the mode of administration of PP as a monthly injectable were detected in this study. The authors thank Dr Shruti Shah (SIRO Clinpharm Pvt Ltd) for writing assistance and Dr Wendy Battisti (Janssen Research and Development, LLC) for additional editorial assistance. The authors also thank the study participants, without whom this study would not have been accomplished, as well as the following investigators for their participation in this study: Tianmei Si, Fude Yang, Hezhao Deng, Jinbei Zhang, Chunlian Liang, Zhengwan Qu, Bin Feng, Qiyi Mei, Jianxiong Fan, Binhong Wang, Kerang Zhang, Honggeng Zhang, Maosheng Fang, Jingtao Zheng, Jisheng Tang, Jicheng Dong, Keqing Li, Huichun Li, Jianchu Zhou, Huaqing Meng, Hongjun Tian, and Yi Cao. This study was funded by Xi’an Janssen Pharmaceutical Ltd (Beijing, People’s Republic of China) who was responsible for study design and data collection, analysis, and interpretation. The sponsor was also responsible for deciding to publish the data and provided a formal review of the manuscript. Tianmei Si, Kerang Zhang, Jisheng Tang, Maosheng Fang, and Keqing Li were the principal investigators for the study. They conducted the study and interpreted the results. Jianmin Zhuo and Yu Feng were involved in study design and the interpretation of results. All authors contributed toward data analysis, drafting and revising the paper and agree to be accountable for all aspects of the work. Jianmin Zhuo and Yu Feng are employees of Janssen Research and Development, LLC. All authors meet International Committee of Medical Journal Editors criteria, and all those who fulfilled those criteria are listed as authors. All authors had access to the study data and made the final decision about where to publish these data. The authors report no other conflicts of interest in this work. Chue P, Emsley R. Long-acting formulations of atypical antipsychotics: time to reconsider when to introduce depot antipsychotics. CNS Drugs. 2007;21(6):441–448. Kane JM, Eerdekens M, Lindenmayer JP, Keith SJ, Lesem M, Karcher K. Long-acting injectable risperidone: efficacy and safety of the first long-acting atypical antipsychotic. Am J Psychiatry. 2003;160(6):1125–1132. Keith SJ, Pani L, Nick B, et al. Practical application of pharmacotherapy with long-acting risperidone for patients with schizophrenia. Psychiatr Serv. 2004;55(9):997–1005. Nasrallah HA. The case for long-acting antipsychotic agents in the post-CATIE era. Acta Psychiatr Scand. 2007;115(4):260–267. Invega® Sustenna® (paliperidone palmitate) extended-release injectable suspension [prescribing information]. Titusville, NJ: Janssen Pharmaceuticals, Inc.; 2014. Hough D, Lindenmayer JP, Gopal S, et al. Safety and tolerability of deltoid and gluteal injections of paliperidone palmitate in schizophrenia. Prog Neuropsychopharmacol Biol Psychiatry. 2009;33(6): 1022–1031. Gopal S, Hough DW, Xu H, et al. 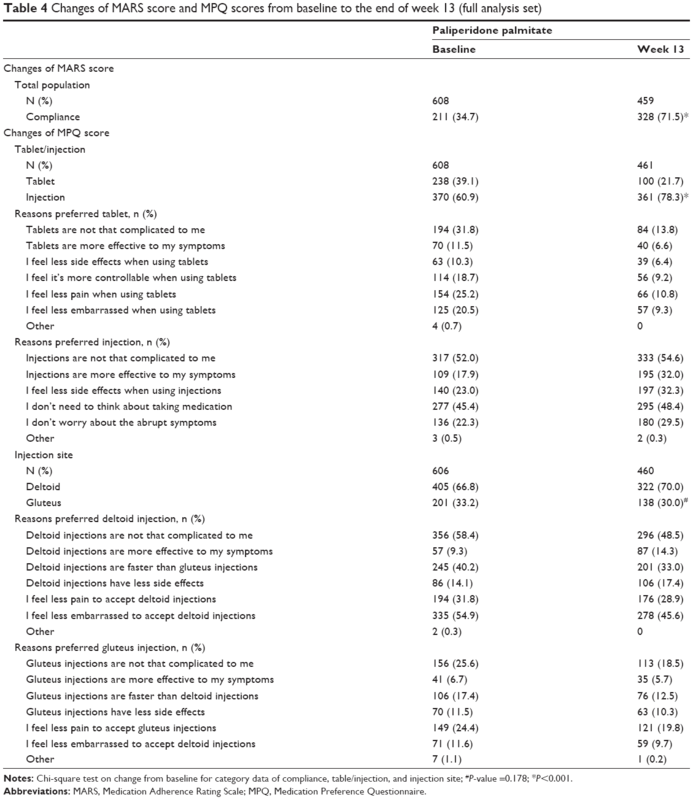 Efficacy and safety of paliperidone palmitate in adult patients with acutely symptomatic schizophrenia: a randomized, double-blind, placebo-controlled, dose-response study. Int Clin Psychopharmacol. 2010;25(5):247–256. Nasrallah HA, Gopal S, Gassmann-Mayer C, et al. A controlled, evidence-based trial of paliperidone palmitate, a long-acting injectable antipsychotic, in schizophrenia. Neuropsychopharmacology. 2010; 35(10):2072–2082. Gopal S, Vijapurkar U, Lim P, Morozova M, Eerdekens M, Hough D. A 52-week open-label study of the safety and tolerability of paliperidone palmitate in patients with schizophrenia. J Psychopharmacol. 2011;25(5):685–697. Sliwa JK, Bossie CA, Ma YW, Alphs L. Effects of acute paliperidone palmitate treatment in subjects with schizophrenia recently treated with oral risperidone. Schizophr Res. 2011;132(1):28–34. Fleischhacker WW, Gopal S, Lane R, et al. A randomized trial of paliperidone palmitate and risperidone long-acting injectable in schizophrenia. Int J Neuropsychopharmacol. 2012;15(1):107–118. Pandina G, Lane R, Gopal S, et al. A double-blind study of paliperidone palmitate and risperidone long-acting injectable in adults with schizophrenia. Prog Neuropsychopharmacol Biol Psychiatry. 2011; 35(1):218–226. Hough D, Gopal S, Vijapurkar U, Lim P, Morozova M, Eerdekens M. Paliperidone palmitate maintenance treatment in delaying the time-to-relapse in patients with schizophrenia: a randomized, double-blind, placebo-controlled study. Schizophr Res. 2010;116(2–3):107–117. Pandina GJ, Lindenmayer JP, Lull J, et al. A randomized, placebo-controlled study to assess the efficacy and safety of 3 doses of paliperidone palmitate in adults with acutely exacerbated schizophrenia. J Clin Psychopharmacol. 2010;30(3):235–244. Schreiner A, Bergmans P, Cherubin P, et al. A prospective flexible-dose study of paliperidone palmitate in nonacute but symptomatic patients with schizophrenia previously unsuccessfully treated with oral antipsychotic agents. Clin Ther. 2014;36(10):1372–1388.e1. Li H, Rui Q, Ning X, Xu H, Gu N. A comparative study of paliperidone palmitate and risperidone long-acting injectable therapy in schizophrenia. Prog Neuropsychopharmacol Biol Psychiatry. 2011;35(4):1002–1008. Geerts P, Martinez G, Schreiner A. Attitudes towards the administration of long-acting antipsychotics: a survey of physicians and nurses. BMC Psychiatry. 2013;13:58. Tandon R. Bridging the efficacy-effectiveness gap in the antipsychotic treatment of schizophrenia: back to the basics. J Clin Psychiatry. 2014;75(11):e1321–e1322. Kane JM, Kishimoto T, Correll CU. Assessing the comparative effectiveness of long-acting injectable vs oral antipsychotic medications in the prevention of relapse provides a case study in comparative effectiveness research in psychiatry. J Clin Epidemiol. 2013;66(8 Suppl):S37–S41. Markowitz M, Fu DJ, Levitan B, Gopal S, Turkoz I, Alphs L. Long-acting injectable paliperidone palmitate versus oral paliperidone extended release: a comparative analysis from two placebo-controlled relapse prevention studies. Ann Gen Psychiatry. 2013;12(1):22. Gopal S, Gassmann-Mayer C, Palumbo J, Samtani MN, Shiwach R, Alphs L. Practical guidance for dosing and switching paliperidone palmitate treatment in patients with schizophrenia. Curr Med Res Opin. 2010;26(2):377–387.